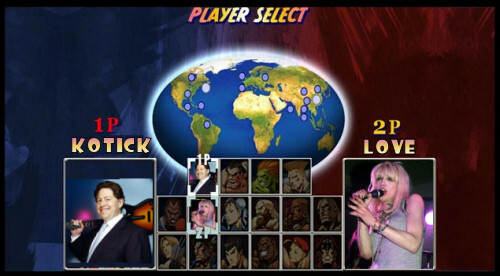 Co-Optimus - News - Courtney Love vs Bobby Kotick - Round 1, Fight! "All right you two, I want a good clean fight, nothing below the belt. That means you, Bobby. We've moved past twitter and now we're gonna settle it out in the open. Courtney didn't know about Kurt Cobain appearing in Guitar Hero 5. Bobby's representing Activision in this little bruhaha. Here we go..."
Courtney: For the record this Guitar Hero *BEEP* is breach of contract on a Bullys part and there will be a proper addressing of this and retraction. FIRST ATTACK! Courtney: WE are going to sue the *BEEP* out of Activision we being the Trust the Estate the LLC the various LLCs Cobain Enterprises. 2 HIT COMBO! Bobby: ... Uhm... I'm Satan? Perhaps Ms. Love forgot? Check out this quote from a month old article over at Rolling Stone. Not only did Cobain’s widow Courtney Love have to sign off on behalf of the estate, so did former drummer Dave Grohl and Primary Wave Publishing, which administers the Nirvana catalog. We will follow this fight with great interest. I'm not sure which of these two to root for to be honest! Page created in 0.2484 seconds.